If you’re a gardener who grows a variety of vegetables, the classic Nicoise dish, ratatouille, should be right up your alley. 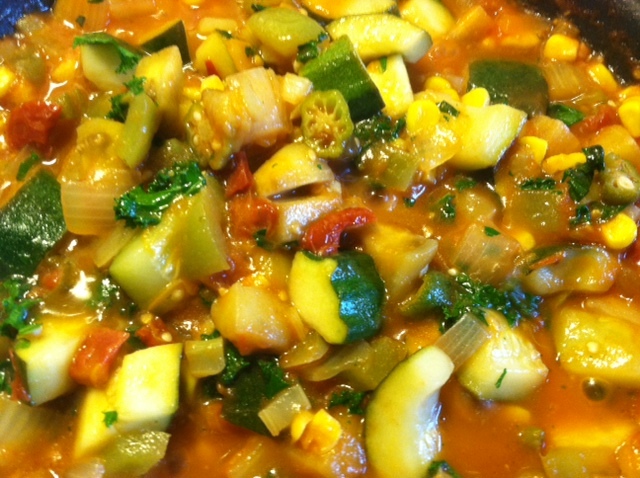 The stewed vegetable entree consisting of eggplant, tomato, pepper, zucchini, onion and herbs has been has been a favorite in France for many, many years, but it wasn’t until about 10 years ago that ratatouille rose to the prominence it enjoys today. That’s when the animated movie by that name from Disney/Pixar came out and a rat with a keen sense of smell named Remy became a great Parisian chef after a soujourn into French countryside. I had been familiar with the dish since the 1970s, when co-workers Tim Fought and Marcia Harris, both prolific gardeners, introduced me to the tasty entree. Since then, I usually make a pot or two of it every summer — it’s very easy to prepare — with fresh produce from my own garden. Place olive oil and add the onion, garlic and celery. Saute for a few minutes and then add the rest of the ingredients except the kale and basil. Cook for about 15 minutes and then add kale and basil. Cook another 5 to 10 minutes. Serve with crusty bread. Whisk vinegar, salt celery seed, and sugar together. Pour over pickles , onions, and peppers. Mix well and coat all. Place in container in refrigerator. Will be ready to eat in 5-7 days. Thanks, Greg. Will have to try.